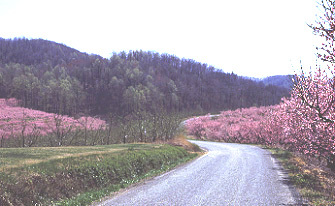 Peach has long been an important fruit crop in Virginia. Currently peach acreage is about 1,773 acres in 2012 (up from 1,484 in 2007). The most commonly grown varieties are Loring, Redhaven, Redskin, Cresthaven and Blake. Virginia ranks ninth in the U.S.in peach production. In 1998, 14 million pounds were produced. A five-year average (1994-1998) of crop value is $2.9 million. See the Crop Profiles for Peach and Nectarine, and Cherry by Tukey et al. (2000). See 2000 Production Data (Natl. Agric. Stat. Serv. PDF).